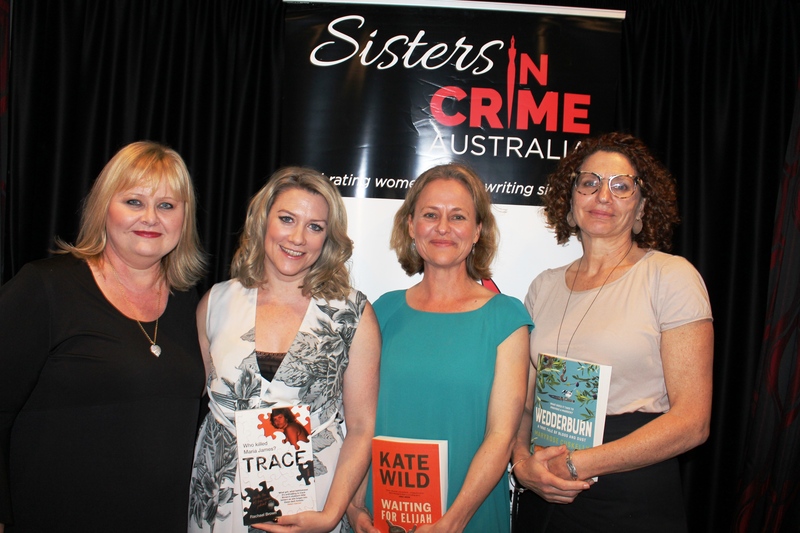 Authors Rachael Brown, Kate Wild, and Maryrose Cuskelly spoke to fellow true crime author Vikki Petraitis at South Melbourne’s Rising Sun Hotel on 19 October about how persistence and perspicacity pay off when it comes to investigating crime. It was a very serious topic and the ensuing debate was both illuminating and profound. But, as always, Vikki’s perceptive wit ensured quite a few laughs. The capacity crowd was enthralled. Sisters in Crime asked all four authors to share their views on justice. 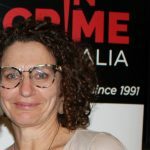 Melbourne ABC journalist Rachael Brown made headlines with her recent cold-case investigation into the murder of single mother Maria James at her Thornbury bookshop in 1980. This became the ABC’s first true crime podcast, Trace, and has been published by Scribe Publications. It has led to calls for the coroner to hold a new inquest. “Justice means many things when it comes to Trace”, Rachael said. “The investigation into the 38-year-old cold case of Maria James has revealed a new person of interest, and helped uncover what the stumbling block has been all these years (a past mistake with DNA inventory thankfully identified by the current cold case squad). Trace has reviewed eight ‘new facts and circumstances’ that have prompted the Coroner to consider holding a fresh inquest, a decision which should be made within the month. Rachael has won numerous awards as an Australian broadcast journalist. Her podcast has won three national awards. Waiting for Elijah (Scribe Publications) by Kate Wild is the culmination of her six-year investigation into the 2009 police shooting in Armidale of Elijah Holcombe, a mentally ill young man— an investigation that not only seeks to answer questions, but also poses some vitally important ones of its own. Kate is an investigative journalist whose work with distinguished teams at the ABC has been recognised with three Walkley Awards and a Logie. Her reports from Darwin, where she lived from 2010 to 2016, laid the groundwork for a Four Corners story on juvenile detention that prompted the calling of a Royal Commission. Waiting for Elijah is her first book. “At the heart of justice is the experience of being heard and believed,” Kate said. Like Kate, Maryrose Cuskelly also tackled small town murder in her book, Wedderburn (Allen & Unwin). “My book Wedderburn: A True Tale of Blood and Dust, tells the story of the murders of Peter and Mary Lockhart and Greg Holmes by Ian Jamieson in October 2014 and the resulting court case. Jamieson – eventually – pleaded guilty to all three charges of murder and was sentenced to two life sentences and one sentence of 25 years (to be served concurrently) with a minimum non-parole period of 30 years. As a man in his mid-sixties with a heart condition, it is virtually certain he will die in prison. On the surface, at least, the legal system has done its job. Justice, ostensibly, was delivered,” Maryrose said. Maryrose is a freelance writer and editor. 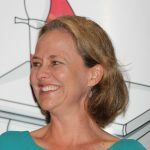 She is the author of two books, Original Skin: An exploration of the remarkable human hide (Scribe 2010) and The End of Charity: Time for social enterprise (Allen & Unwin 2008), which she wrote with Nic Frances, and was the winner of the Iremonger Award. Last year Maryrose won the Thunderbolt Prize for Crime Writing (Non-fiction) for her essay “Well Before Dark”. 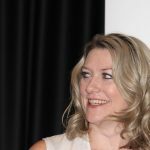 Compere Vikki Petraitis is the author of 15 true crime books and has contributed stories to four true crime anthologies. According to Vikki, “The journalist or the true-crime author who lets a story get under their skin, appreciates what it is like to live and breathe a case, sometimes for years. Piecing the puzzle and solving the crime take precedence over most other things. At the heart of this journey is a quest for justice in whatever form it can take,” she said. Vikki’s new book, Inside the Law: 25 years of true crime writing (Clan Destine Press) will be out before Christmas.